You are currently browsing the category archive for the ‘yakitori’ category. Trying to find a Japanese place to eat that is open in those hours between lunch and dinner is a challenge in every city; Japanese restaurants are one of the few who actually close between service here and worldwide. I did a search for nearby places that were open and luckily found Harajuku Taproom nearby. They have not been open long, but from what I’ve tried, and from what seems to be a steady local clientele, they will have an appreciative audience. 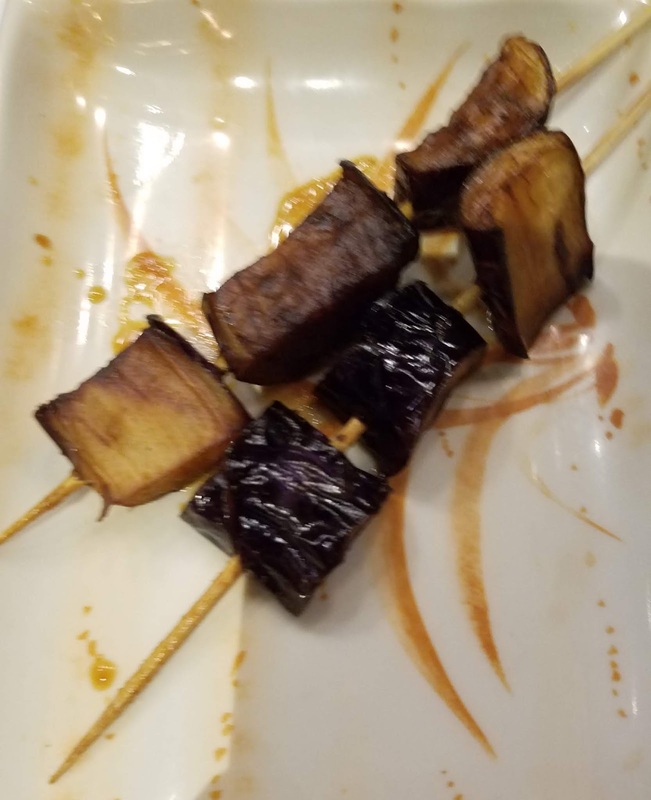 The variety of pickles was a good indication of the rest of the menu at this craft sake and beer place where the emphasis is on quality and uniqueness, e.g., one of the pickles was pickled eggplant! The miso glazed sirloin steak was tender and one bite told you that they used quality meat. 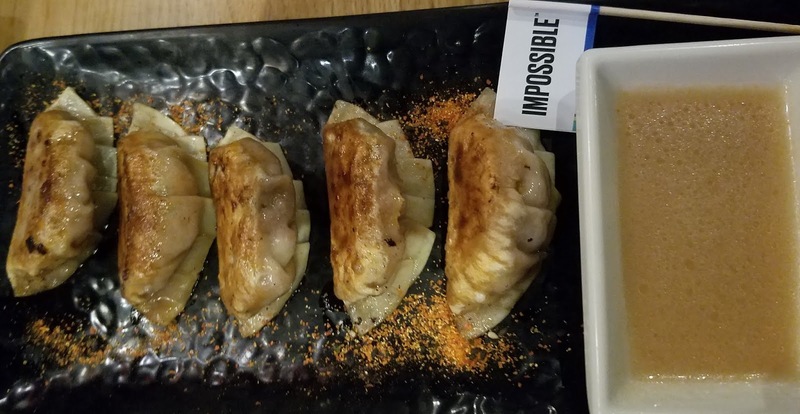 Their impossible gyoza are house made with a ginger sauce, and they were addictive. 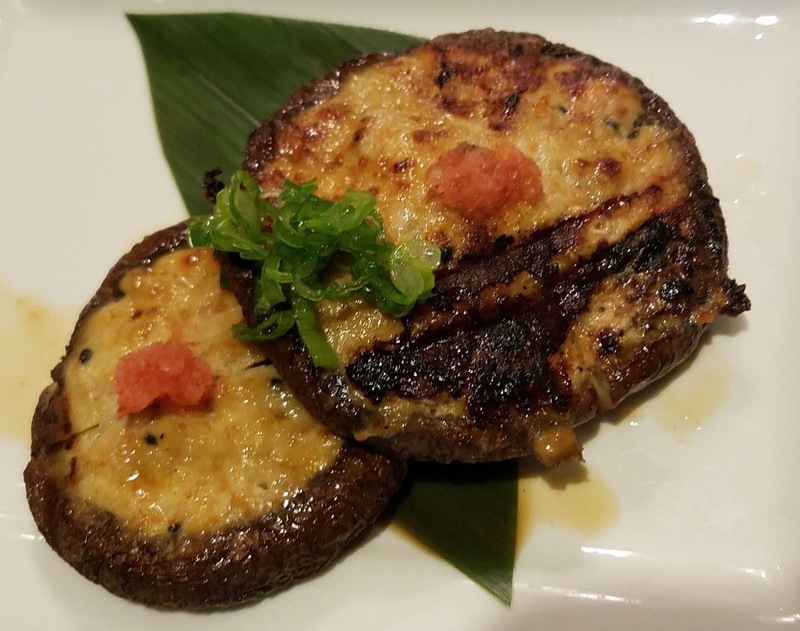 I like miso, so the eggplant with miso glaze was the next choice and a great way to eat your vegetables! 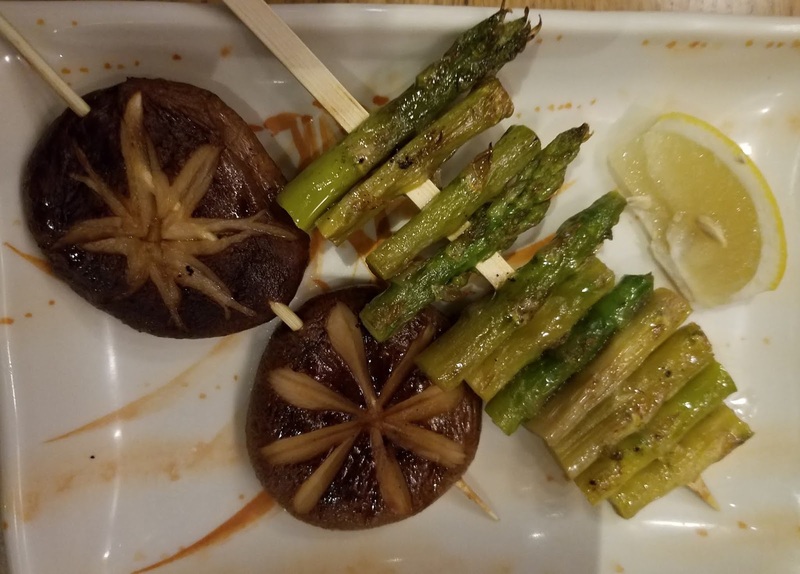 A beautiful way to tempt your taste buds is to order the shiitake with soy and the asparagus with lemon. We also tried the chicken breast with yuzu pepper, but we at it all before I could snap a picture 🙂 The only misstep of the evening was the tempura ice cream which had to be redone and still came out looking like a sad child’s painting with a coating that wasn’t nearly crisp enough. 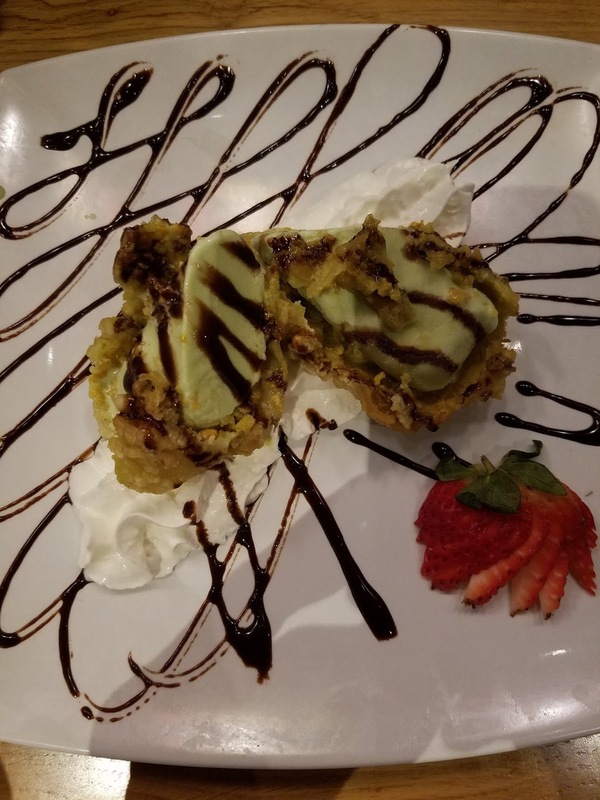 The service more than made up for the dessert, with one of our servers, Gregory, having lived 6 years in Japan, he presented each dish with proper pronounciation and traditional manners; something appreciated by everyone whether they speak Japanese or not. Make a reservation, or go for happy hour before this neighborhood gem becomes so popular that you will have to wait in line to get inside. 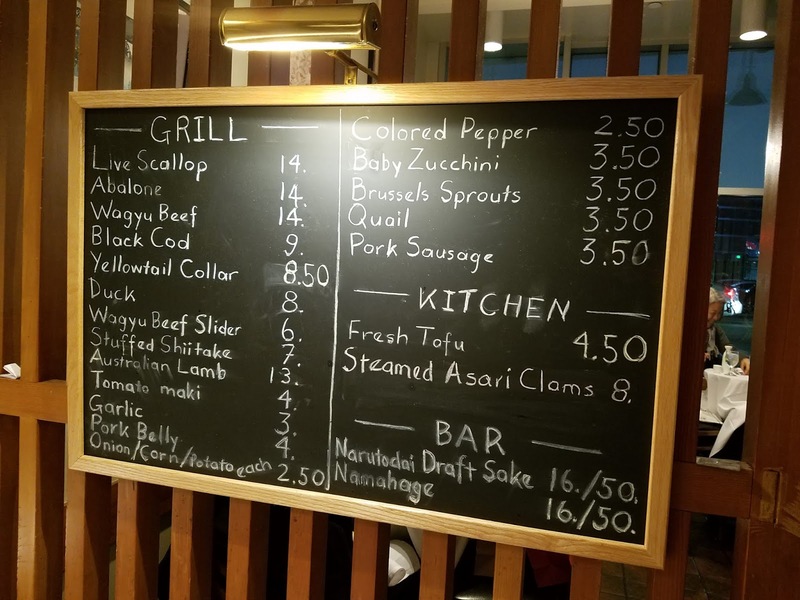 A small family run restaurant is always my preferred choice Nanban-kan has been a yakitori (grilled skewers) favorite of mine for years, so I was happy to introduce a local to this hidden treasure that almost literally requires a treasure map to find. Most skewers are in the $4 range and include 2, so you can mix and match several to match your appetite and sense of adventure. 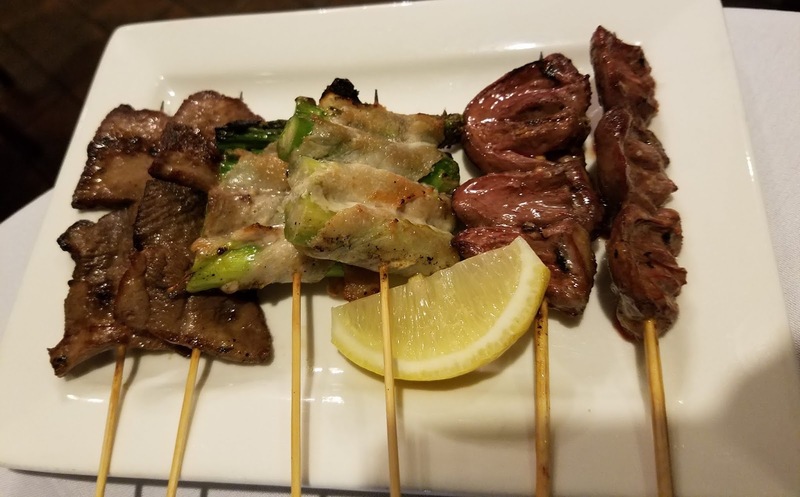 With choices ranging from chicken hearts and tongue, to the pork belly wrapped asparagus and seabass, I chose a bit of everything 🙂 My favorites were the chicken hearts and sea bass, with the asparagus coming out third, I found the beef tongue a bit tough and dry, but still decent. My friend ordered the comforting chicken and rice dish since he was getting over an illness. It came with a colorful array of pickles and miso soup, so a perfect remedy for those with sensitive stomachs or a compromised immune system. The stuffed shitake mushrooms were filling but not vegetarian since they were stuffed with ground chicken. We tried the daily special of yellowtail collar and found it a bit over cooked but very fresh. The owner is the hostess who rules the roost with a very fair system and a warm smile, making sure clients who reserved were seated promptly, but those who arrived late were asked to wait. Walk-ins were offered the front tables with the same impeccable service as the main dining room. I was very happy to to found quality and service still prevail in this small enclave of hospitality and great Japanese grilling. Nanban-kan is literally steps away from the Nuart Theater so you may be wondering how I’ve managed to walk by this neighborhood favorite for so many years. My answer is simply that I usually watch movies in the afternoon so by the time Nanban-kan opens I am no longer in the vicinity. I finally went one day because I was stuck on Santa Monica Boulevard at 6pm and my favorite butchers, Lindy &amp; Grundy love it. I figured it was a sign to stop and eat when I was literally stopped at one traffic light for THREE changes and had moved ONE car length. It is not an exaggeration when the news reports that traffic is the worst aspect of life here in Los Angeles. Like my nearby favorite Italian restaurant, Il Grano, this place is quiet, refined, and comfortable, with an owner who cares about every guest and the food on every table. The ratio of servers to diners is nearly 1:2 so my water was constantly refilled, my empty plates were instantly whisked away, and my next course was promptly fired as soon as I finished what was in front of me. They serve both yakitori and sushi here, and since it was my first time, I concentrated on the yakitori. 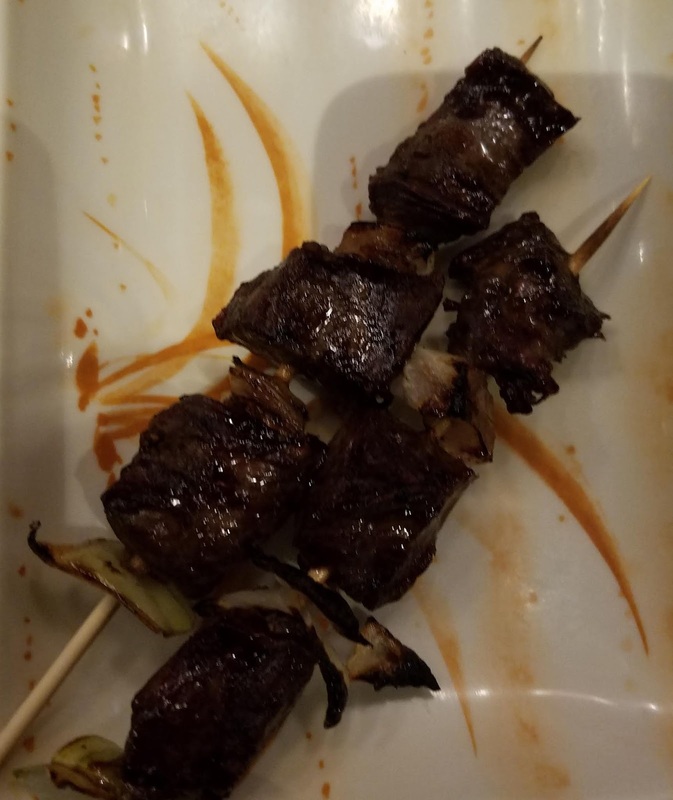 Most skewers were between $10-$20 and they had specials hand written on a blackboard. I asked my waitress what she recommended for a vegetable and she said the asparagus with bacon was a favorite. I could taste why when it arrived. A thin layer of bacon draped over the grilled asparagus made it a nicely luxurious and meaty bite. One of the regular menu items was “five fishes”, and if you like fried smelt, you will love these lightly battered, crisp filets. 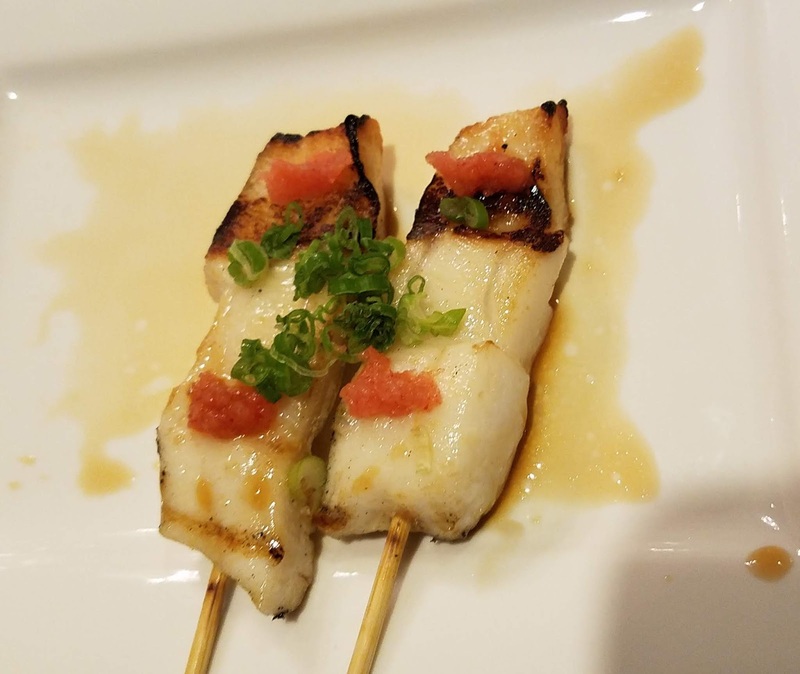 One of the blackboard specials was the sea bass and it was probably my favorite skewer of the evening with freshly chopped scallions and an almost sushi presentation of grated radish with ponzu. I don’t know if it was my desire for iron or my love of pâté, but I had to order the chicken livers. They were nicely done but I would have like a bit more salt on them instead of the slightly sweet teriyaki glaze. I finished with the special grilled quail. It was so simply and marvelously grilled that it needed nothing except my fingers to pick it up so I could clean off the delicate meat from the small bones. If you love quail or have never had it, this is a wonderful place to experience it. They say that we only use about 10% of our brains, so if I extrapolate that to trying restaurants, I’ve only eaten in 10% of the restaurants in my neighborhood. Living in Los Angeles, the percentage for me is probably more like 1% since I not only walk, but drive. 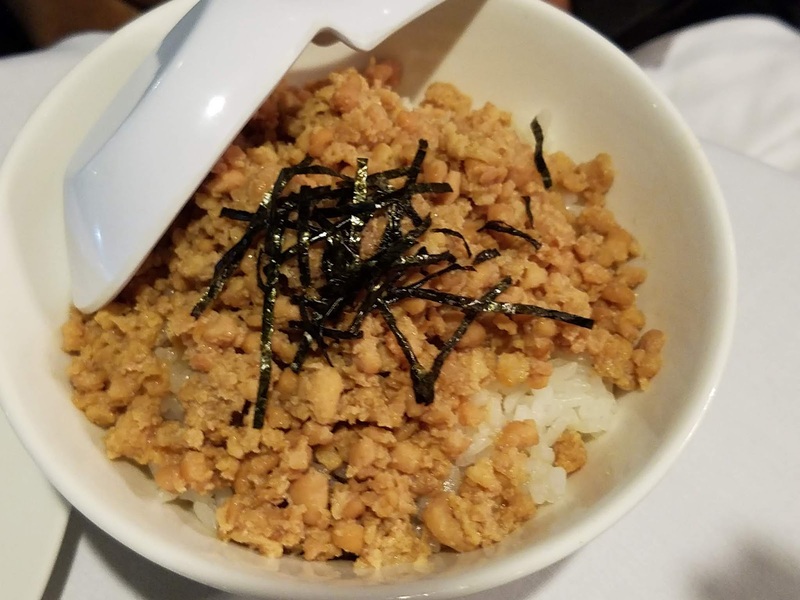 I would never have thought I would be thankful for terrible traffic, but it was due to horrible traffic that I stopped at Nanban-kan and added to that 1% with a fantastic find that I don’t have to test my patience to drive to in my neighborhood.